Arnold Savage is a renowned award-winning quilter who predominately uses vintage fabrics in his works. These vintage fabrics were collected by himself and his ancestors of the previous 4 generations. 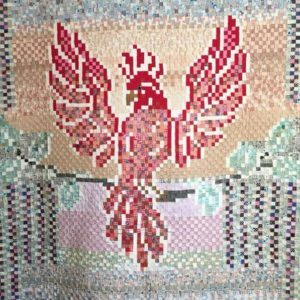 The mixtures of these fabrics can be quite stunning as seen in Cockatiel, shown above. Cockatiel was begun by Mary Alice Hegy in the 1920s – 1930s. The piece was passed on to her sister, Mary Madonna Savish who finished the piecing and began the quilting. Mary Madonna’s son, Arnold Savage, finished the piece in 1978. Fabrics included span from the 1880s to the 1930s. 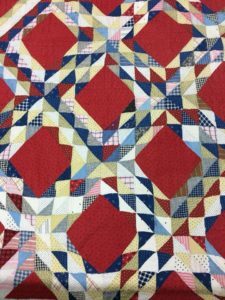 Another beauty included in the exhibit is a 69″ square Ocean Waves quilt utilizing a very colorful collection of scraps from the 1860s – 1890s, set against a red background. This one was made by Arnold’s Grand Uncle, John Albert Hegy, c. 1890. And lastly, I will mention Feathered Stars and Roses made by Arnold’s Great, Great Grandmother, Gertrude Hegner Fisher. Pieced of red, white, and blue solid colored cottons, it is beautifully and closely quilted, 14 stitches to the inch, in crosshatching, straight line, rosettes, feather wreaths and and an exquisitely running feather vine border that turns the corners nicely, and is evenly spaced on all four sides. This one is dated c.1850. 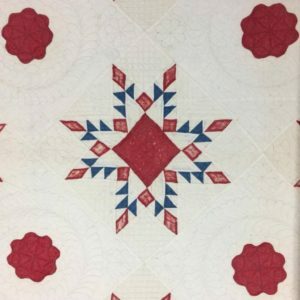 Please stop in to see this beautiful collection of quilts! The exhibit will be open February 27, 2018 through May 12 and will be open Tuesdays through Saturdays, 10am – 4pm.